Unlike poker, in the entertainment world you can’t beat a full-house. 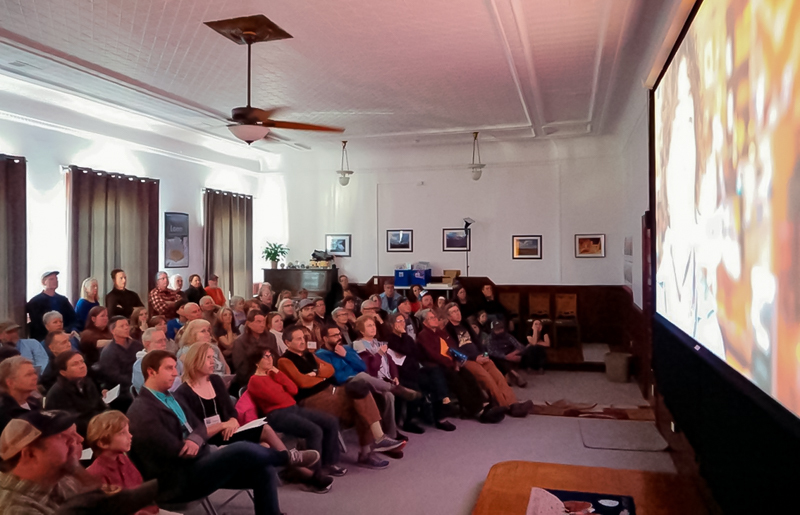 Such was the case Saturday night for the 2nd annual Plum Tuckered Film Festival when upwards of a hundred people showed up for the event. Nearly two-dozen short films from around the world were offered to the very appreciative audience. Eight films were represented by filmmakers who traveled from Pennsylvania, Maryland, Ohio, Berkley Springs and of course…Tucker County! Filmmakers were present for three of the five awards announced during the After Party at Stumptown Ales. A Fascination with Change by Jack Kelly won Short Documentary, Appalachia; K.B. Montgomery won Short Narrative, Appalachia with his beautifully moving film Deepest Violet; White Grass 2016 by Joel Wolpert won Short Adventure film, Appalachia with Chip Chase there to accept. Our Australian entrant, Nic Barker won Short Narrative with his engaging film, Dead Sharks, and for the Animation/Experimental/Music category, Meghdad Asadi Lari from Rochester, New York won with a spectacular animation, Simorgh. This year marks the second year for PTFF and the first year in Verglas Media’s spacious large-screen viewing room. A theater quality sound and projection system afforded an optimum viewing experience not seen in this region for many years. While films are invited from around the world, PTFF wants to build support for our local filmmaking community. To that end, special awards target filmmakers from our Appalachia region. Whether you’re an experienced filmmaker, an aspiring film student or making the best use of your smart phone or GoPro, Plum Tuckered is looking for great movies for next year! Show off your creative skills and enter the 2017 competition. Contact us at www.PlumTuckeredFilmFestival.org.